NinjaFirewall (Pro+ edition) Access Control is a powerful set of directives that can be used to efficiently protect a website. In this article, we will see how to quickly secure a Joomla! installation. joomla.org: How do you password protect directories using htaccess? 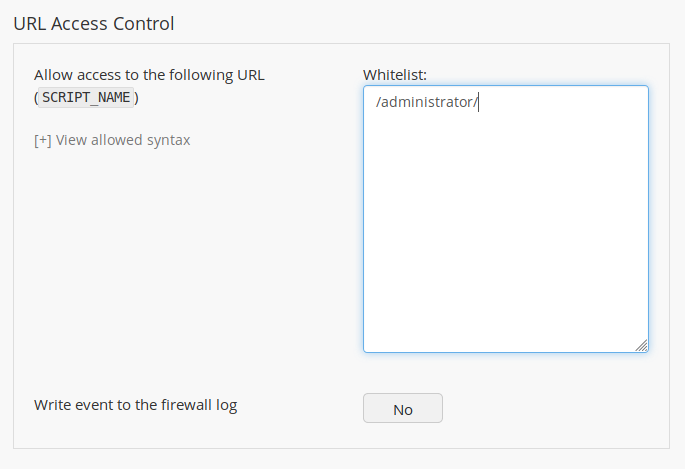 Now that the whole /administrator/ directory is password-protected, it is relatively safe to whitelist it and all its PHP files, so that the administrator will never be blocked by NinjaFirewall when working from the Joomla! administration console. /cache/, /cli/, /components/, /images/, /includes/, /language/, /libraries/, /logs/, /media/, /modules/, /plugins/, /templates/ and /tmp/. Any attempt to access a PHP script in one of those folders will be immediately blocked by the firewall. 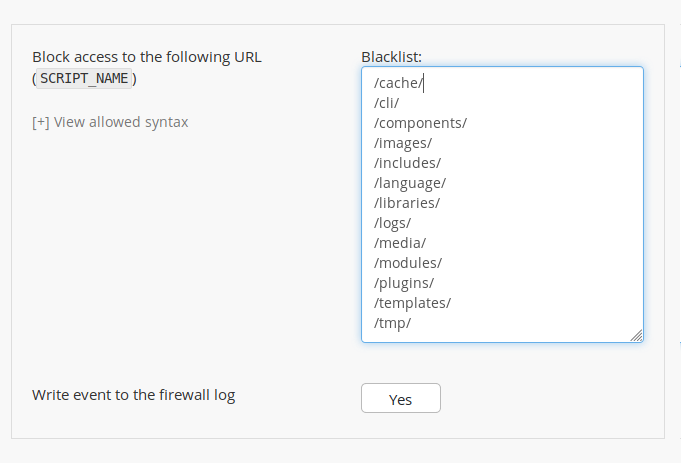 If you had a PHP script in one of those directories that needed to be directly accessed (e.g., http://domain.tld/plugins/foo/bar.php), you would need to add it to your “Allowed URLs” whitelist, otherwise it would be blocked. This does not apply to a default Joomla! installation. Previous Many popular WordPress security plugins vulnerable to IP spoofing. Next Installing NinjaFirewall with HHVM (HipHop Virtual Machine).